Gallia Academy senior Oliver Davies tries to clear the bar during an attempt in the pole vault event held on April 30 during the Battle for the Anchor at Point Pleasant, W.Va. THE PLAINS, Ohio — The Gallia Academy track and field team finished first in the boys team standings and third in the girls competition on Wednesday at the Athens Open. The Blue Devils won the boys title with a score of 71, 26 points ahead of second place Athens. Marietta placed third with a total of 41, while Athens ‘B’ squad finished fourth at 18. In relay events, the Blue Devils’ 4x800m relay team of Jarrell Scott, Chancey Odom, Francesco Russo and Brant Rocchi was second with a time of 9:57.22, while 4x200m squad of Ryan Donovsky, Ian Hill, Cory Call and Spencer Harris was second with a mark of 1:37.78. The quartet of Hill, Harris, Zac Loveday and Caleb Greenlee also earned second place in the 4x400m relay with a time of 3:53.14. John Stout led GAHS with a pair of winning efforts in 200-meter dash (23.27) and 100-meter (11.50), while Ian Hill was the 300-meter hurdles champion with a mark of 44.64. Hill also captured second in the 110-meter hurdles with a time of 18.00. 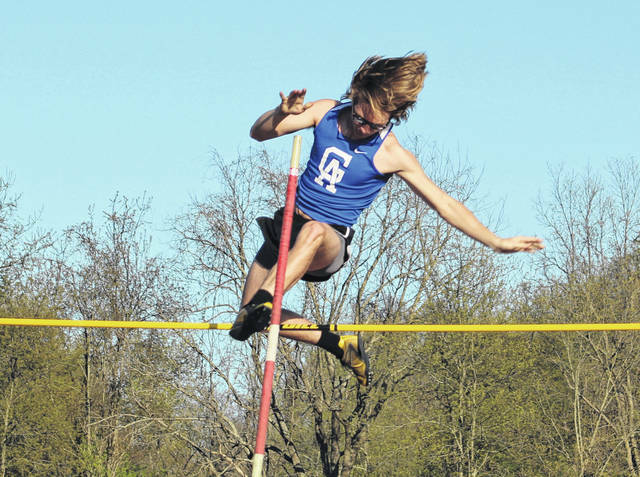 Gallia Academy earned the top-two spots in the boys high jump event, as Zac Loveday (5-10) produced and championship effort, while Harris took second place with a height of 5-8. Ryan Donovsky finished first in the long jump (19-8½), while teammate Cory Call earned second place honors with a distance of 19-5½. Donovsky also earned a second place finish in the 100-meter dash with a time of 11.92. The boys shot put event produced a pair of top-two finishers for GAHS, as Riley Starnes (38-9½) captured top honors, while Nathan Mitchell (38-6½) took second. Oliver Davies added a second place effort in the pole vault (10-0), while Cole Rose finished second in the discus throw (105-05) to conclude the top-two finishers for the Blue Devils. On the girls side of the meet, Athens won the team title with a score of 76½, while Marietta was second at 65. The Blue Angels were third at 23½, as Athens ‘B’ team rounded out the field with seven points. Sarah Watts led the GAHS girls team with a pair of top two-finishes, capturing first in the 800-meter run (2:27.56) and second in the 400-meter dash with a mark of 1:03.61. Eliza Davies provided a second place effort in the high jump (4-8) to conclude the top-two finishers for the Blue Angels. Visit www.baumspage.com for complete results of the 2018 Athens Open.